An attractive door hanger is much more eye catching than a standard flyer and won't get lost in the stack of other advertisements. Because of their effectiveness, door hangers are in high demand! Our door hangers are printed various stock types including our most popular 16pt and 100lb cover and coated in aqueous gloss or UV gloss (high gloss / laminate). FREE UPGRADE: OUR 16PT DOOR HANGERS ARE NOW COATED WITH UV gloss, UV is a thicker laminate applied after the printing process. Much higher quality products than most print shops carry! Whether your industry involves landscaping, pizza delivery, contracting, cleaning or anything else. 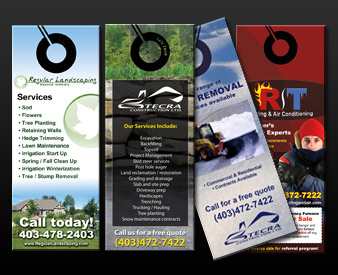 Whether you've had success in the past with or are interested in trying a new door hanger campaign, Business Cards Canada (dot net) will offer you the best possible prices on door hanger design and printing. Our door hangers are printed in full CMYK colour. All rates are for double sided, full colour door hangers! 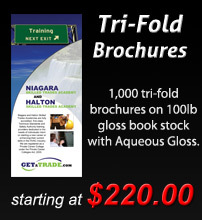 Over 90% of our clients prefer to order their door hangers double sided. After investing time and money printing and distributing them, why not make use of as much advertising space as possible? 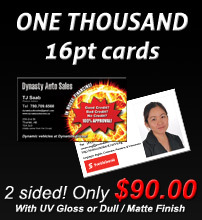 We won't quote you low and then upsell you to double sided like most printing companies do. 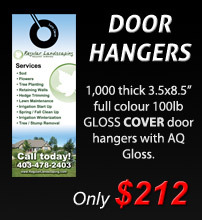 These base prices are for full colour, double sided, premium quality door hangers. If you are interested in discounted pricing for single sided or black and white door hangers feel free to contact us for a custom discounted quote. * Pricing is subject to change, not guaranteed; Prices do not include shipping. 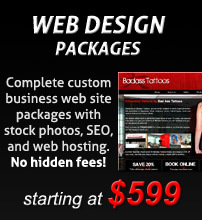 Request a design proof, a small deposit may be required depending on the project specifics. We can usually respond to your request within a couple of hours.